Two girls, one log cabin, and a whole lot of work. After eight weekends of work, we have finally (nearly) finished the kitchen! With all the demolition finally completed, it’s so rewarding to be making visible progress each day. On Saturday, Jen sanded the final coat of plaster and we put on a coat of primer and two good coats of paint. The metal shelving from Ikea went up — with the normal amount of Ikea-related bitching — and we finally had a kitchen! The fridge is resting on three one-inch boards to be level, but who’s going to notice when cold beer is at hand? Here’s a photo and a short list of materials we used. 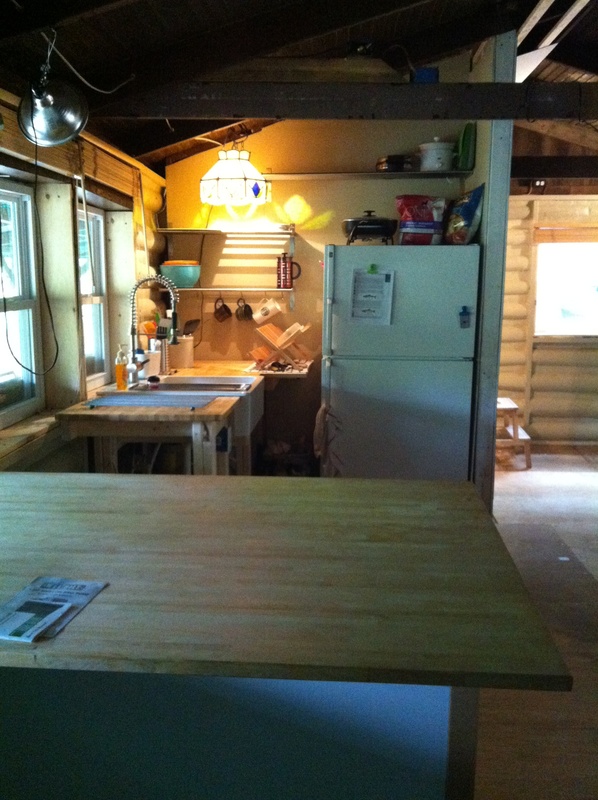 The next kitchen project (far, far down the road) will be adding cabinet faces and eventually purchasing a small range. These are the tales of our renovation of a 360 sq ft log cabin on the banks of Muddy Creek in Pennsylvania.